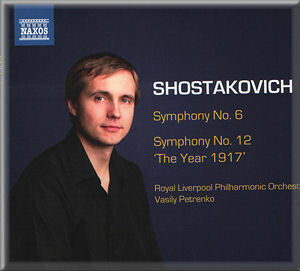 Naxos continues its series of top-notch Shostakovich symphony recordings by Vasily Petrenko and the Royal Liverpool Philharmonic with two of the composer’s most unusual works. Of the two, the Sixth has continued to gain in popularity and is performed now quite often in the major concert halls throughout the world. The Twelfth, for obvious reasons, has not shared this fate. For me, the Sixth is one of Shostakovich’s greatest purely orchestral symphonies, right up there with the Symphonies Nos. 4, 8, 10, and 15. After answering his critics and the Stalinist party apologists with this Fifth Symphony, which immediately became one his most popular works, the successor was something of an enigma — though it, too, was very well received at its premiere performance. Its first movement Largo was perhaps his most profound symphonic statement up to that time. And what did Shostakovich do? He followed it with two short movements, one witty, the other humorous and boisterous. I think he was making a powerful statement here in answering his earlier critics: “I did what you asked in the Fifth and now I’m doing it my way!” At least, that’s how I see it. Shostakovich was never anything if not ironic. The work may at first seem unbalanced, but it makes perfect sense in a Shostakovich sort of way. Petrenko here does not disappoint. He captures all the power and bleakness of the opening movement with a tempo that is slower than most. Only Jurowski (19:59) and Boult (20:02) take longer with it. He finds tempos closer to the norm in the following movements and captures all the joy and humor there. The playing of the Royal Liverpool Philharmonic is beyond reproach. I would refer you to John Quinn’s review of this disc for his discussion of some of the highlights in Petrenko’s account of this symphony. I will now turn to the other symphony on the CD. Many consider the Twelfth to be Shostakovich’s weakest symphony, and I am not one to disagree with this opinion in general. Yet, I must say that Vasily Petrenko in this blistering account almost convinces me otherwise. I have listened to it several times and, though the ending is almost too bombastic to bear, Petrenko brings out all kinds of detail to make the work interesting. I compared this with Haitink’s Concertgebouw recording on a disc that also includes a powerful performance of the Sixth. Where Petrenko surpasses Haitink in the Twelfth is in his lighter approach. He beats Haitink by almost 8 minutes in overall timing, but tempos alone don’t tell the whole story. Petrenko treats the work as a symphony and leaves most of the political baggage behind. Even in the fourth movement one is drawn to many instrumental moments of real beauty, for example, the horn solo at 3:26 followed by trumpet at 3:40; the horns again at 5:13 and the rapt strings at 6:07. Maybe this is a case where the whole is not greater than or even equal to the sum of its parts, but there are some really tremendous parts in this work. If one wants to observe the October Revolution of 1917, Shostakovich’s later tone poem October would seem a better choice, as the work is under 13 minutes and captures the revolutionary spirit as well if not better than this symphony. Still, I know I will turn to Petrenko just to appreciate what he has done to make the symphony palatable. As is the custom with Naxos, production values are not shortchanged either. The CD comes with a cardboard sleeve with Petrenko’s photo in full color and then the foldout insert itself has a memorable black and white photo of the composer and detailed notes by Richard Whitehouse. I won’t be tossing out my Haitink recording of these symphonies, but Petrenko’s accounts must now take pride of place. At budget price, this disc is unmissable.